The fate of some of the biggest political leaders in Himachal Pradesh will be sealed in electronic voting machines by Thursday evening as more 50 lakh people cast their votes for the 68-member legislative assembly. The election results, however, will be announced 40 days later on December 18 along with those of the Gujarat assembly polls, to be held next month. 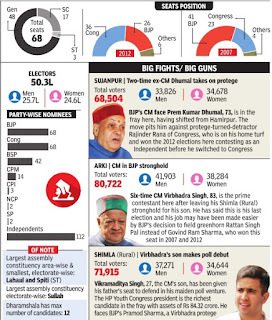 This election is crucial for chief minister Virbhadra Singh, 83, who will be eyeing his record eighth election to Himachal Pradesh legislative assembly and seventh stint as CM of the state. Singh has already announced that this was going to be his last election. Apart from a strong anti-incumbency this time, the CM has also faced the onslaught of corruption charges against him. Virbhadra, however, has led a determined campaign against the BJP , which fielded almost all its top national leaders at rallies, including PM Modi, party chief Amit Shah, Uttar Pradesh CM Yogi Aditya Nath. While the BJP leadership addressed 107 election rallies across the state, Virbhadra had 87 rallies for Congress candidates without much help from national leaders. BJP's chief ministerial candidate Prem Kumar Dhumal is facing the challenge of bringing his party back to power. Amit Shah declared him as the saffron party's chief ministerial face after surveys and intelligence reports showed that without him at the helm, the contest would be tough. 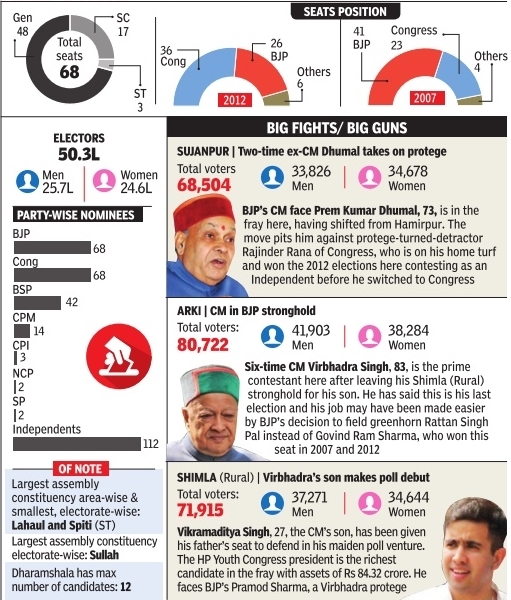 The Aam Aadmi Party has given Himachal Pradesh a miss.There are seven rebels from Congress and six from BJP making the contest three cornered in various assembly segments.